Emotions and adrenalin ran high at Fr Ranger Oval on Saturday night as the Warwick Cowboys and the Wattles Warriors opened their NRL season playing for the inaugural Basil Nolan Memorial Trophy. Member of the Nolan family and their friends travelled from far and wide to lend their support to the event as both teams and members of the public acknowledged Basil Nolan Jnr who tragically lost his life in a farming accident last November. Nolan, a stalwart supporter of the Cowboy’s and former A Grade prop who played in a grand final for the club rekindled his association with the Cowboys club rejoining the committee just prior to the accident. The Cowboys and Wattles will now play for the Shield in their opening clash of each season. With the adrenalin pumping Warwick shot away to a 16-nil lead with tries to Harry Sullivan Cody Byrne and Book Croft. Captain Mick Bloomfield was successful with two of the three conversions. Just prior to half time tensions boiled over and after some push and shove Mick Bloomfield and two Wattles players Nathan Gaulton and Matt Duggan found themselves in the sin bin to cool down. On the stroke of half time the home side received a penalty and Matt Marshall slotted a penalty goal from 40 metres out to give the Cowboy’s a comfortable 18 nil lead at the break. Shortly after play resumed, the sin binned players returned to the field and in no time Gaulton, the Wattles’ back rower had made amends for his earlier indiscretion scoring his first try of the season to put Wattles on the board. Duggan converted and there was a suddenly a sense of urgency about the Wattles players that was missing in the first half. Travis Burns was the next to score and the Duggan conversion narrowed the margin to 18-12. 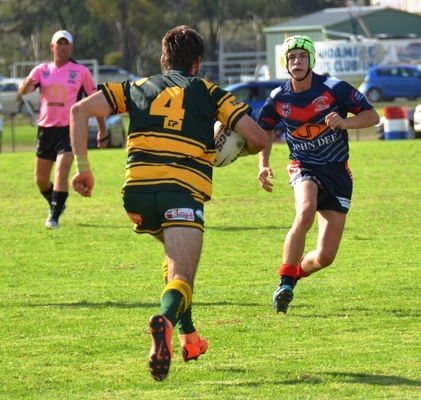 Two weeks ago, Coedie Tandy who is one of the real journeymen of league on the Southern Downs and beyond ran the water for the Cowboys in the Barrett Shield Trial game. On Saturday night Tandy took his place in the Cowboys starting line up at five eighth and was instrumental in setting up winger Mitch Watson for the next try extending the score to 22-12. Wattles found their rhythm and looked much better in the latter stage of the game, Mitch Koina scored and Matt Duggan put his side even closer with a successful conversion. With less than five minutes remaining the game was in the balance at 22-18. The Cowboys defence was brilliant and as the big crowd got behind them it was clear this game meant a lot to the players. As the clock wound down Wattles threw a long pass which went astray and the Cowboys denied them any further chances. The score at the final siren in the inaugural Basil Nolan Shield game 22-18. Basil Jnr would have been proud of the Cowboys and his wife and sons who were on hand to present the Shield to Mick Bloomfield and the team. After the game, Bloomfield who was named Man of the Match rated the game, the win and the award as one of the highlights of his career. In other games on Saturday the boot of Wattles kicker Travis McDougall proved the winning difference in the Under 18 game. The final score Wattles 30 – Cowboys 28. In the Reserve Grade game Wattles ran out big winners with a 44-6 score line. After their forgettable first half on Saturday Wattles will be hoping they produce a better start to their first home game when they host Highfields on Saturday. The Cowboys are away to Dalby on Sunday and will be hoping to continue their winning run.